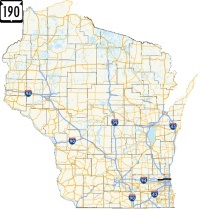 Quickie Summary: State “Trunk” Highway 190, a.k.a Capitol Drive, is a major east-west throughfare in the Milwaukee area. Starting as a charming little street leaving the charming village of Pewaukee, it rapidly becomes a six-lane highway going through the booming area of Brookfield. It cuts through the heart of Milwaukee’s north side, and some rough areas, before crossing I-43 and entering re-emerging neighborhoods like Riverworks and Riverwest. 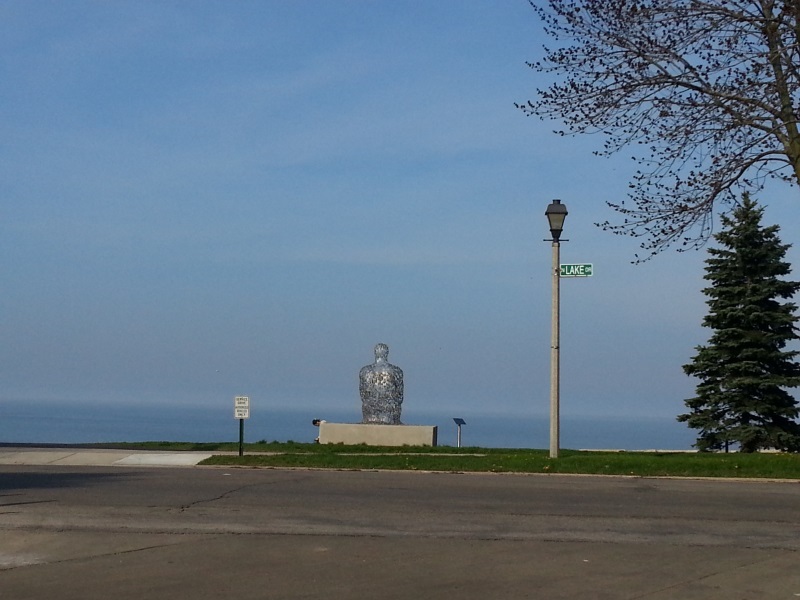 Upon crossing the Milwaukee River, you’re suddenly in the tony suburb of Shorewood, finally ending along a beautiful vista at Atwater Park overlooking Lake Michigan. Truly a transitional highway from start to finish. The Drive (West to East): Highway 190 is known as Capitol Drive for its entire length and was named in 1947 after U.S. 16 was re-routed south to enter Milwaukee on Blue Mound Road. It’s always been a major thoroughfare in the area and today is multi-lane for almost all of its length, expect for the western and eastermost mile. We begin at the westernmost mile… just before the technical start of Highway 190, along the waters of Pewaukee Lake. 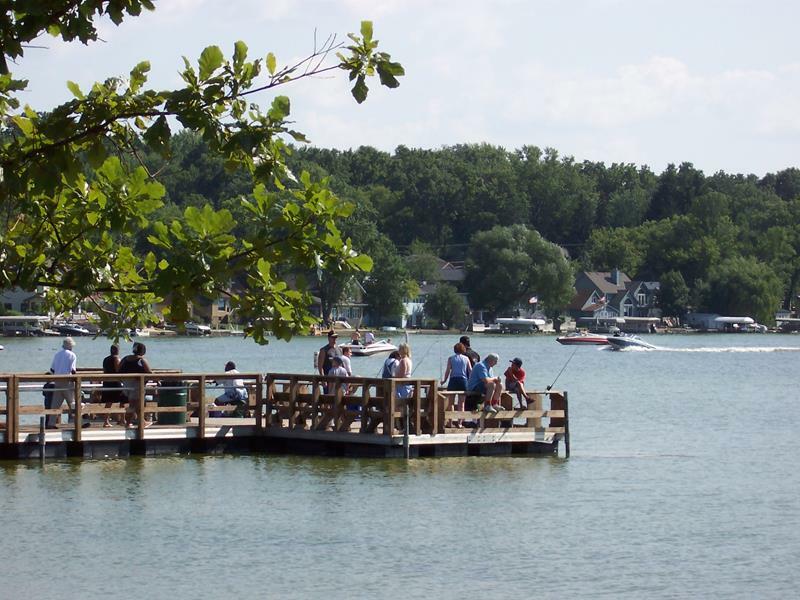 Next to the beach, across from stores and restaurants, a pier juts out into Pewaukee Lake. 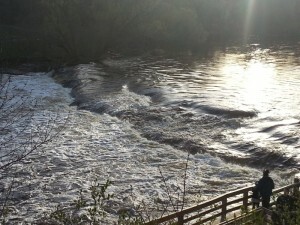 Plenty of people enjoy fishing on this particular summer day. Extending east from this area is Capitol Drive, where Highway 190 begins just west of the freeway junction with today’s Highway 16. This is the center of Pewaukee (pop. 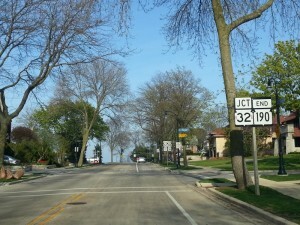 13,195), which surrounds the eastern end of seven-mile long Pewaukee Lake. The main street fronting the lake was recently rebuilt with a series of storefronts that feature everything from a bike shop to a sub shop to an upscale piano bar. The beach bustles with swimmers and sunbathers all summer, and lake homes – both new and old – stretch along the north and south shores of the lake. 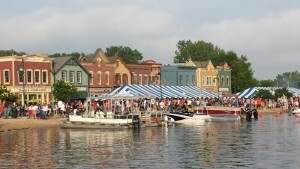 The boating theme is appropriate; Pewaukee holds the world headquarters of Harken, Inc., a leading manufacturer of sailboat hardware and accessories. Highway 190 heads east out of downtown Pewaukee and under Highway 16, which goes south to I-94 at GE Healthcare’s massive complex and west all the way to La Crosse and Minnesota. It used to continue east along Capitol, but now it’s 190’s turf and has been since 1947. The “new growth” area of Pewaukee is on either side for the next several miles, past chain restaurants, sprawling commercial and office complexes, the crossing of Highway 164 (which has moved around a bit over the last few years) and into some open territory for a few miles before suburbia hits again. Just over the Fox River and some marshlands, open soccer fields are in view. This must mean it’s Brookfield (pop. 40,000 and climbing). This is a booming money town; it’s equalized value is third-highest in Wisconsin, behind only Madison and Milwaukee. Yet, it has its history and notable figures, too: Caroline Ingalls, Laura Ingalls Wilder’s mother (remember “Little House on the Prairie”?) was born in Brookfield back in 1839; Al Capone had a hideout in Brookfield in the 1920s; even Oprah’s mom lives here now. This city sports three NFL players (Joe Panos, Joe Thomas and Matt Katula) and Olympic medalist Kip Carpenter – and strip malls… lots and lots of them. Capitol Drive is less strip-mally than its neighbor to the south, Blue Mound Road (U.S. 18), and the new developments here take on a nicer look, as evidenced by the Shops of Brookfield at the intersection with Brookfield Road. Microbrewery Alert. Just south of Highway 190/Capitol Drive, a little under a mile via Brookfield Road, is the “old” downtown Brookfield. They’re working on having it come back, with small shops and restaurants popping up. You’ll also find the Biloba Brewing Company on Pleasant Street just off Brookfield Road, which opened in 2014. With beers like Smokin’ Gramma and Dark Side of the Brew, microbeer lovers will want to make a stop. Along this section through Brookfield, Highway 190/Capitol Drive is a wide boulevard with a speed limit of 50; many mis-read it as 65 or 70. 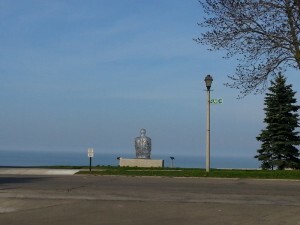 On a high hill at the light with Calhoun Road, you can see the flashing radio towers close to Lake Michigan and, if trees aren’t blocking your view, a glimpse of downtown Milwaukee to the southeast – about 12 miles away as the crow flies. Under the underpass with Pilgrim Road and past Lilly, commercial structures line your way until you approach 124th Street. At 124th Street, you enter Milwaukee County and the city of Wauwatosa (pop. 44,798). First settled in 1835 and originally called Hart’s Mills, Wauwatosa was renamed in the 1850s; the name is Potawatomi for “firefly” (or maybe “glow worm” or “lightning bug”, since the term for those flying flashlights varies.) Just east of 124th Street, a massive Harley-Davidson plant is to the north, where they make a large percentage of the engines and other major pieces of our favorite hogs. Milwaukee’s western “bypass”, the Zoo Freeway (I-41//U.S. 45), crosses over Highway 190 at this point. Wauwatosa is somewhat of an “edge city”, with the Mayfair shopping complex and suburban office towers just south along Highway 100. To the south of Highway 190/Capitol Drive just after I-41/U.S. 45 is Currie Park, where one of the world’s first airliners took its maiden flight in 1919. This was the original Milwaukee County Airport land; today, the only man-made things flying around Currie Park are golf balls, since it has a nice course. There’s also a dome that can be used for practice during bad weather – which is often five months of the year. The border zigzags around here, but around Grantosa Drive is the city limits of Milwaukee (pop. 596,000), Wisconsin’s largest city, the 28th largest city in the United States and home to so many things a special section on the State Trunk Tour site tells you about it all. Milwaukee holds the World Headquarters of companies like Northwestern Mutual, Harley-Davidson, Rockwell Automation, A.O. Smith, M&I Bank, Manpower, and more; it even held the Office of the Commissioner of Major League Baseball until Bud Selig retired. 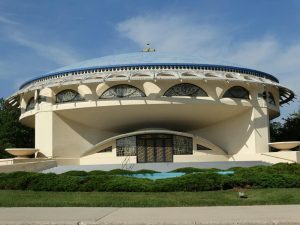 Highway 190/Capitol Drive is the main east-west route through the city’s north side, an area that only skims the surface of everything Milwaukee has to offer. 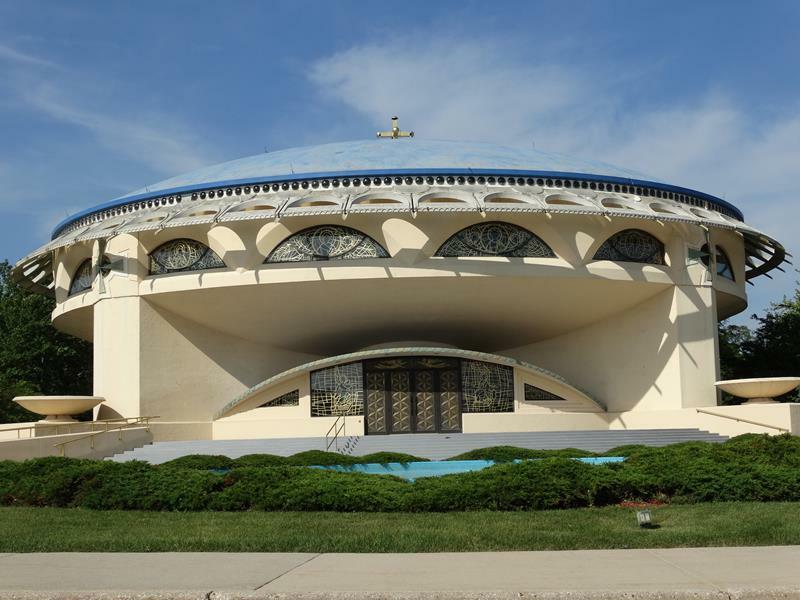 Easily accessible from Capitol Drive is the beautiful Annunciation Greek Orthodox Church, designed by Frank Lloyd Wright. 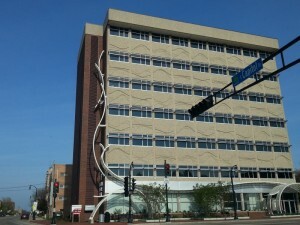 Completed in 1961, it was one of Wright’s last works and is on the National Register of Historic Places. To reach it, follow Grantosa Drive north to Congress. The Church is at 9400 W. Congress. Highway 190/Capitol Drive crosses Appleton Ave (Historic U.S. 41, now Highway 175) and further east, Highway 145 (Fond du Lac Avenue). This is a complex area where Midtown Center, which began life in 1956 as Capitol Court, one of the Milwaukee area’s three original “shopping centers.” This is the heart of Milwaukee’s North Side. As you continue east, tree-lined neighborhoods begin to take over. Crossing Sherman Boulevard, meeting up with Roosevelt and ducking under the railroad tracks, you enter a huge complex that lies to the south; this is where A.O. Smith’s original factory was located. This massive manufacturing complex cranked out everything from auto parts to water heaters in one form or another for over 110 years. Now in redevelopment phase, what is now being called “Century City” is being viewed as the next generation in manufacturing for Milwaukee. Some manufacturers have already moved in and some jobs are being created, bringing optimism to the area. It’ll be interesting to see what transpires. 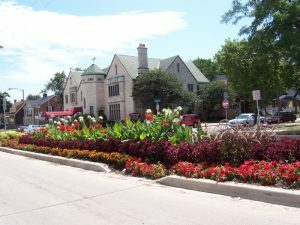 The stretch of Highway 190/Capitol Drive with Highway 57 on the north side of Milwaukee is a nice boulevard – recently redone – with well-kept older homes flanking it on both sides. Highway 57 heads north along Green Bay Road and Highway 190 crosses I-43 before ducking under Port Washington Road and entering an area known as “Riverworks”. An industrial corridor for literally centuries now, you’re just south of the World Headquarters for Koss Headphones (just up Port Road) and north of a series of old factories, some of which are being retrofitted for new uses. Some are new manufacturing, some are becoming art galleries. Just after the Milwaukee River crossing, you can turn north on a parkway and explore Estabrook Park, a beautiful, versatile recreation area filled with forests, trails, playgrounds, a disc golf course, and the Estabrook Beer Garden, one of several that have cropped up in the Milwaukee County Park System. 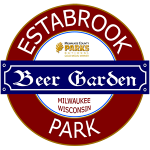 Reviving the city’s long tradition, Estabrook was the first public beer garden in the United States since the repeal of Prohibition when it opened in 2010. The Garden is perched on a bank above the Milwaukee River and sells litres and half-litres of beers imported from the Munich Hofbräuhaus. The view of the river, and the trails you can walk closer to it, add to the experience of sitting with hundreds of others, listening to music, enjoying a traditional German pretzel, and just spending a nice relaxing day in the park. It’s definitely a State Trunk Tour favorite! 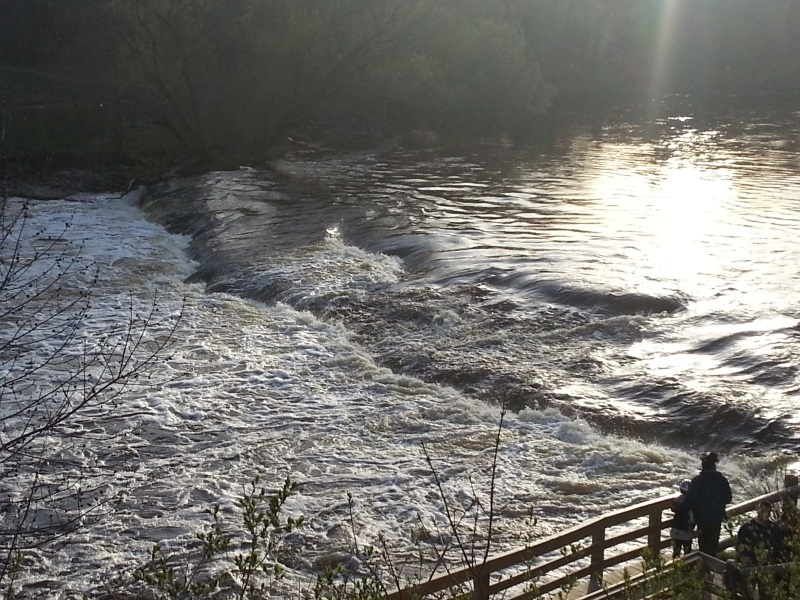 Estabrook Park features some beautiful areas along its parkways and trails. Along the Oak Leaf Bike Trail, just north of Highway 190 via the parkway, you’ll find this stretch of the Milwaukee River. The seasonal Biergarten overlooks this magnificent stretch, popular with kayakers. The Oak Leaf Trail lets bicyclists, runners, etc. span Capitol Drive on a new bridge replacing an old one that let the railroad do the same thing for decades. Also right here, Highway 190/Capitol Drive gets spanned by the Oak Leaf Trail, a former major railroad line popular today with all kinds of runners, bikers, and people who put wheels on the bottom of cross-country skis. 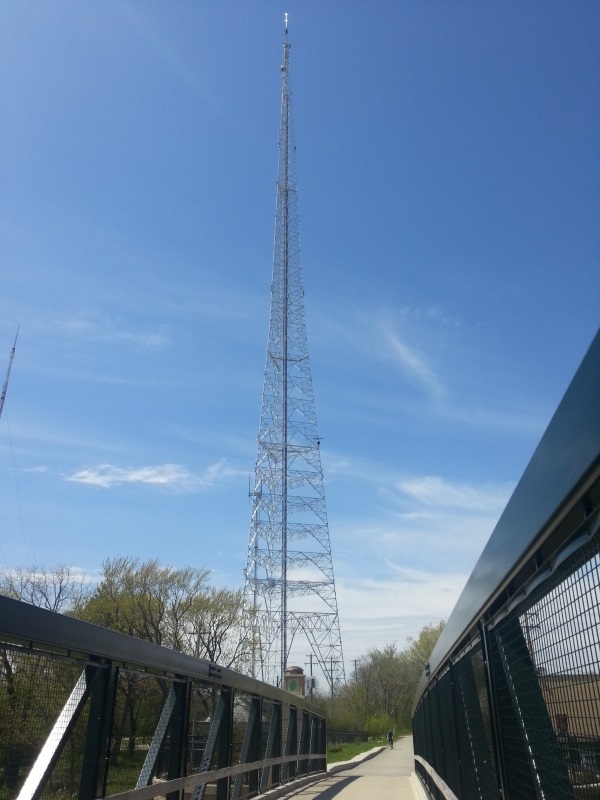 The WITI-TV Tower (the grey metal one) along Highway 190 in Estabrook Park is 1,078 feet tall. When it was completed in 1962, it was the tallest free-standing tower in the world until the Tokyo Tower in Japan decided to add 50 more feet to their tower . It stands about 450 feet taller than Milwaukee’s tallest building, the U.S. Bank Tower. Past the bridge, you enter Shorewood (pop. 13,763), a charming suburb that was once known as “East Milwaukee.” Shorewood is where former U.S. Supreme Court Chief Justice William Rehnquist grew up; it’s also where the movie Airplane! was made possible, since directors Jerry Zucker, David Zucker and Jim Abrahams also grew up here. So it’s high court or high comedy: choose your favorite. Shorewood is a coffee shop-laden village where many residents walk to get what they need. Like Brookfield is the modern-day suburb, Shorewood is the more traditional American suburb. Great shopping is available along Oakland Avenue, starting north from Capitol Drive; continuing east, you return to the small two-lane street style that Highway 190 began with back in Pewaukee. It ends with Lake Michigan in full view at the intersection with Lake Drive (Highway 32); a turn in either direction is filled with tree-lined neighborhoods with beautiful homes. Milwaukee is to your south; other “North Shore” suburbs are to the north. Or, you could get out of your vehicle, walk east and enjoy the beach along Atwater Park. Not bad! Highway 190 ends at Highway 32 along Lake Michigan. As you come to the end, you happen upon Atwater Park and the beautiful view of Lake Michigan… choose from the cliff above or the beach below. • HIghway 190 was originally U.S. 16 into Milwaukee along Capitol Drive; U.S. 16 was re-routed and Highway 190 appeared in 1947. • The WITI-TV tower along Capitol Drive was the world's tallest man-made structure for six months starting when it opened in 1962.